Sweet Virginia: Navy... the new chocolate brown? Navy... the new chocolate brown? 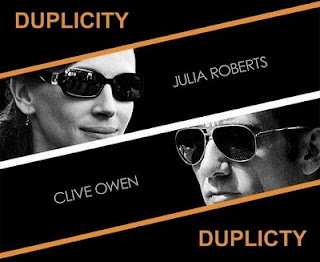 Another recent navy moment was while watching Duplicity (which I enjoyed more than expected, mostly because of the corporate strategy with P&G and J&J-like companies. Loved the opening slow-mo fight between CEOs). Julia Roberts is an undercover corporate spy, and the CEO has her in his office asking if she can be trusted. Her makeup artist lined her brown eyes (actually just the lids) with a heavy, unsmudged strip of navy eyeliner. Although Jamie Lee Curtis tells the adorable Anna Chlumsky in My Girl, "You can never wear enough blue eyeshadow," blue is a color I have been told I can't wear with my coloring (brown eyes, light brown hair, warm skin tone). I am fully expecting to be arrested by the fashion police because I now wear navy and purple eyeliners and navy, purple, and charcoal clothes. P.S. I googled Julia's makeup in Duplicity and found this site: comments from her makeup artist about her eyeliner and then product links... very cool.